Bay leaves are oval-shaped leaves from the Bay Laurel tree. They have a warm and pungent aroma with an aromatic and slightly bitter flavour. They are used in a wide variety of cuisines from around the world, from European to Indian and everything in between. They an essential herb in Bouquet garni along with thyme, marjoram and parsley. There are two culinary types of bay leaves; Turkish and Californian. The Turkish has a more subtle flavour than the Californian variety and is more commonly grown and used in Australia. Only one or two leaves are needed to enhance a whole roast, pot of soup or stew. Dried leaves are less bitter than fresh & have a sharp pungent aroma. Add 1-2 bay leaves whole while cooking and remove before the dish is served. 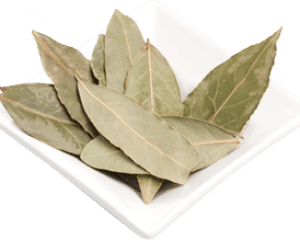 Bay leaves are a good source of vitamins and minerals. They have mild diuretic qualities and are used to improve digestion. It is rich in vitamin A, vitamin C, iron and manganese.